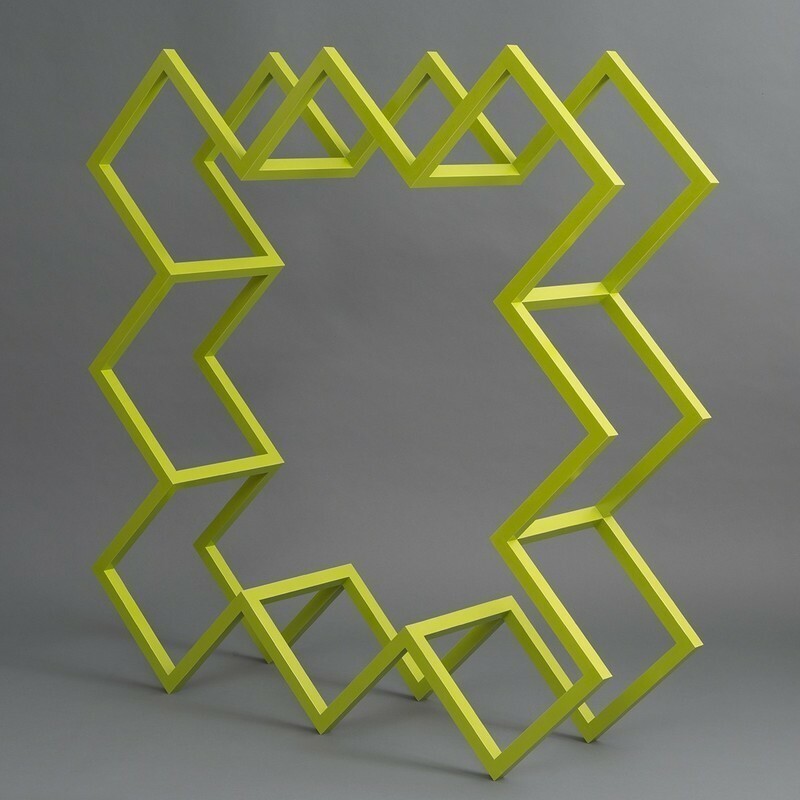 EMI OZAWA's skillfully crafted sculptures show thoughtful attention to line, form and color. The simplicity of her geometry—repeating circles, lines and squares—belies the complexity of her thematic concerns. In kinetic sculptures and wall-hung sculptures that change dramatically as the viewer walks past, she explores of the relationship between looking, touching and moving. Emi studied at Joshibi University of Art and Design and Tokyo School of Art. She earned her BFA in Craft/Wood at The University of the Arts (Philadelphia) and her MFA in Furniture Design at Rhode Island School of Design. She has exhibited widely throughout the U.S, in London and in Tokyo. 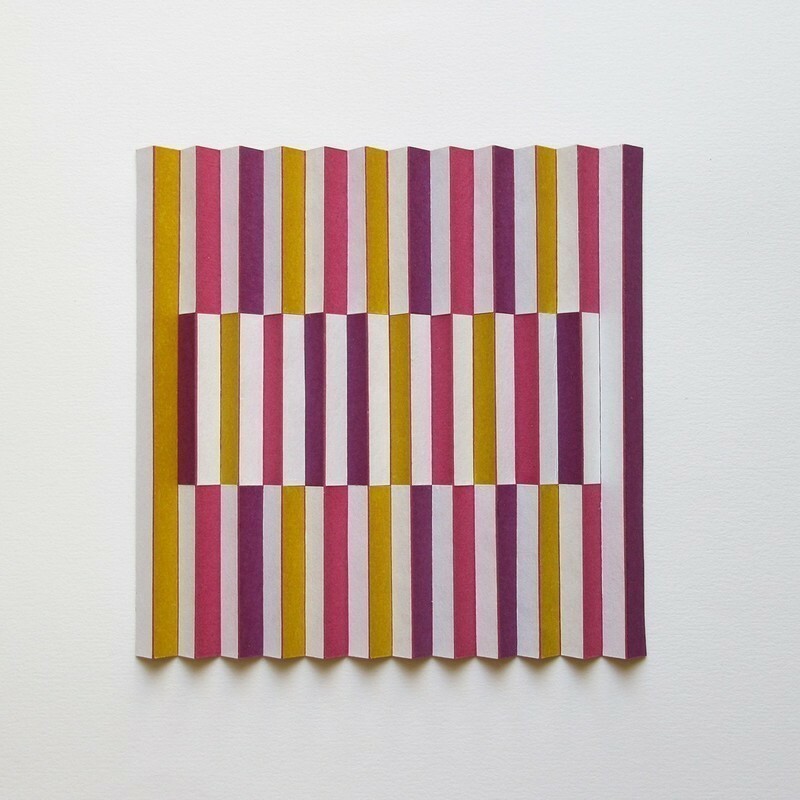 In January 2018, Emi's solo show Follow The Line opened at Richard Levy Gallery. The gallery will also take her work to Art Miami in December 2018. Her work was included in the group show Parallax : A RAiR Connection Exhibition (2018) at the Roswell Museum and Art Center, alongside Featured Artist Justin Richel. In 2019, Emi will be an artist-in-residence at Tamarind Institute in Albuquerque, New Mexico, where she lives and works. OtherPeoplesPixels: You studied graphic design and furniture design. How did that inform the work you make now? Emi Ozawa: while I was working as a graphic designer, the feeling of wanting to create 3D objects by my hand grew. I had the idea that objects could be kinetic and interactive. The reason why I started learning woodworking was to make my sculpture steady for touching and moving. 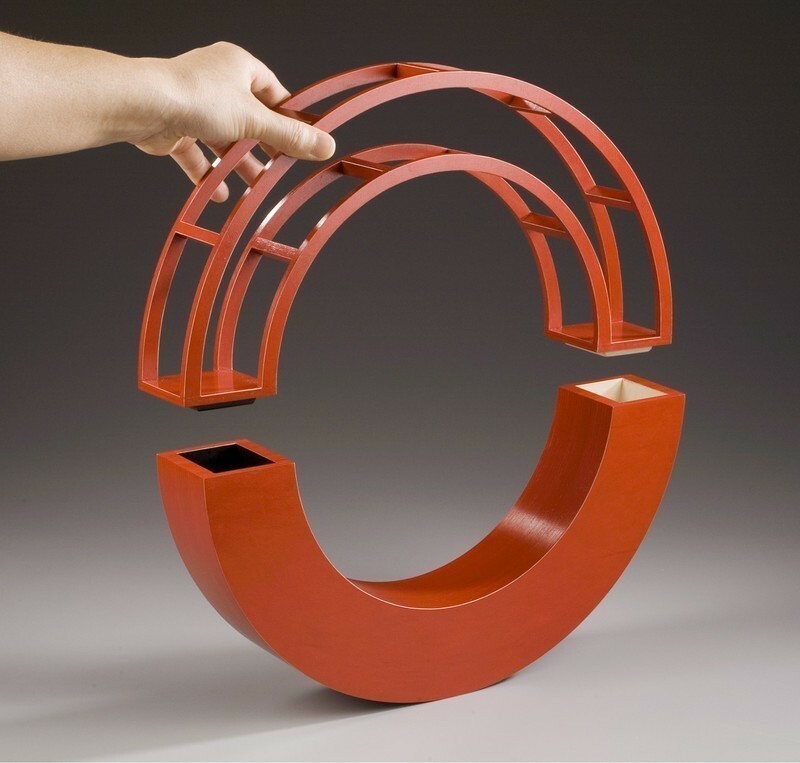 I was interested in furniture as objects that have a built-in invitation to touch and move. I also wanted to learn about wood. I love the feel and the texture of this material. Square on Square, 2010. Acrylic on apple plywood with brass. 19.75" x 20" x 3". Photo credit : Margot Geist. OPP: What led you away from functional objects toward visual art? EO: From the start, I was combining my sculptural ideas into furniture. I wanted my work to be inviting. You can sit, you can open a door. Its function was secondary for me. For instance, Bird table’s surface is very limited. My ‘box form’ sculptures—like Wound Up(2001) and bOX (2001)—have very small inside spaces. Each piece has very unique way of opening and closing. They needed to be explained by someone present, sometimes a piece would be displayed in a case, all of this intruded on the viewer’s full experience. Gradually I felt that I wanted my work to be independent like a painting on a wall. Viewers are invited to look and have an experience of interaction without touching. Further more, I wanted to focus on surface painting more than spending too much energy with building mechanical parts and joints. Red Bridge, 2004. Acrylic on apple plywood with brass. 15" x 15" x 2.5". Photo credit : Mark Johnston. OPP: In your statement, you mentioned that play is a central concern of your work. 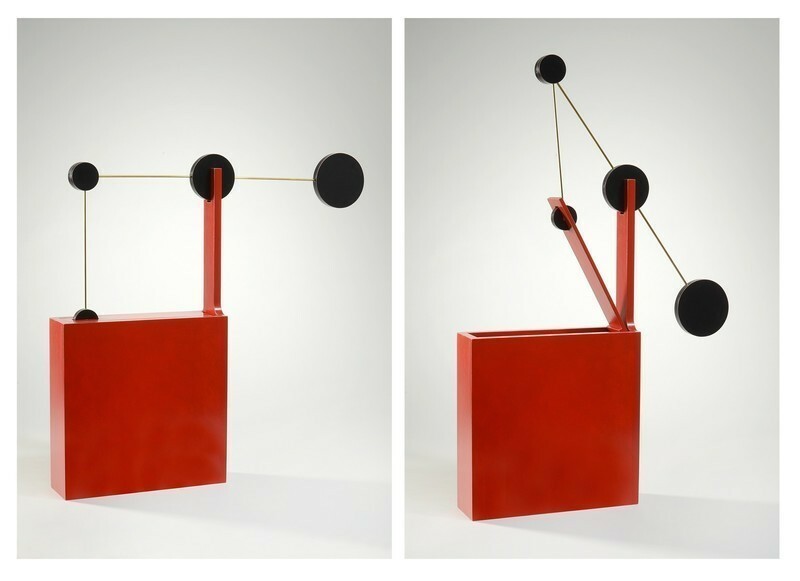 Early kinetic works like Triangle Train (2009) or See Saw 2 (2002) could be touched. What makes an interactive work a sculpture versus a toy? Does that distinction matter to you at all? EO: Yes. This distinction matters to me, but I can’t help it if others blur the line between the two experiences. Making art which applies itself to our instinct to play is the connection I am seeking. I think a toy is for the users—user-centered. That’s why a lot of toys are made safe for certain ages, for certain development, or there is a room for how to approach the toy. Speaking about my interactive sculpture, there is a very specific way that a viewer can interact with the piece. When it’s activated, it shows a movement or a surprise which I created to share. So it is artist-centered. Rain on Rain, 2016. (front, left and right side views). Acrylic on poplar. 48" x 28.5" x 2." Photo credit: Margot Geist. 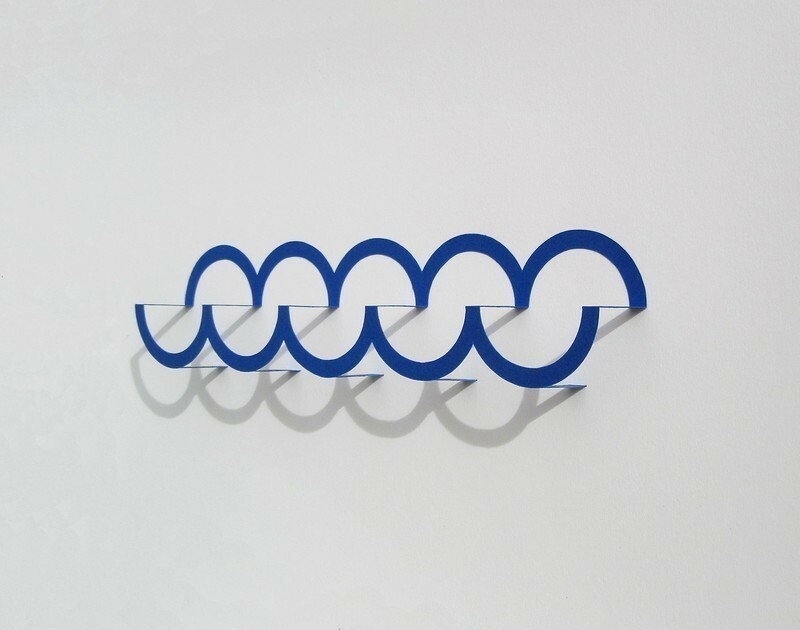 OPP: Your wall sculptures are very much about visual perspective. They change if you look at them from different points of view. Is this pure abstraction? Or do you think of these abstractions as metaphors? EO: I think a lot of them are pure abstraction using color and geometry, but some are developed from my response to nature. For example, I considered rain drops falling in Rain on Rain (2016), the moon in a night sky in Once in A Blue Moon (2014) and the vivid colors I see during Summer season in One Summer Day Takes a Walk (2013). I like working with squares and circles because they are my favorite language. They tend to relate, and I use them towards what you are talking about in terms of visual perspective. Drifting Mist (two views), 2015. Acrylic on poplar. 15" x 15' x 1.875". Photo credit : Margot Geist. 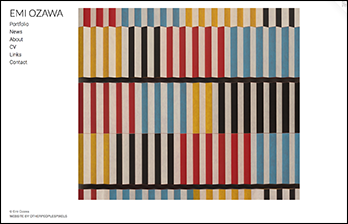 OPP: When I first looked at works like Kaki to Yuzu (2018) and Blue Line (2017), I thought of variations on the Modernist grid and the textile grid of weaving, as well as an accumulations of ladders against the wall. Then I googled Amidakuji (2016) and had a whole new perspective. Can you explain for non-Japanese speakers? EO: Amidakuji is a common game of chance in Japan. You just need a pen and a paper. You draw vertical lines of participants number which could be two to however many. Then add horizontal lines in between the vertical lines, write prizes or numbers at the bottom end of the line and hide that detail. Each player can add more horizontal lines. Now the game begins. Each participant picks a line. You track the path downwards from the top. Following the line, it crosses sometime with other path but never overlap. When you reach the bottom, you find the prize. When I started drawing this idea, I thought everybody knew about it. Then soon I found out it is not common in USA. As far as the purpose of the game goes, picking the shortest straw might do something similar. OPP: How important is it that viewers understand this reference when looking at the work? EO: I structured these three pieces based on this game and applied this rule to color these lines. I wouldn’t be making these works without knowing Amidakuji. But it can be looked at as a sculpture without its references. Though it is not a must, I mention its inspiration because it is part of it for me, as is this work’s relation to the Modernist grid you mention. 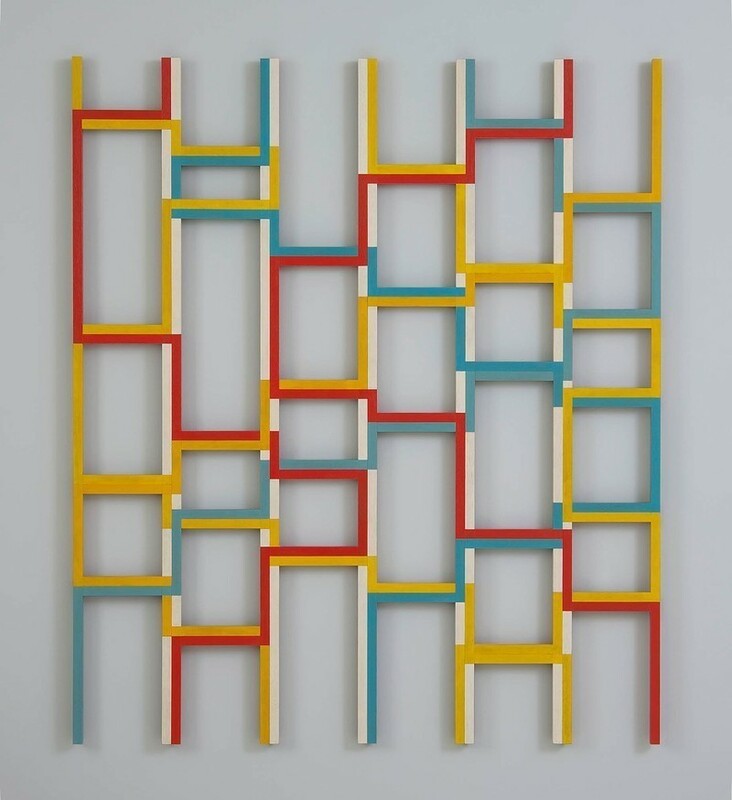 It is interesting to see similarities in Mondrian’s structure and this game. Five Blue Circles, 2018. Paper on board. 10" x 15" x 2.5" frame. OPP: Many recent wall sculptures are made of paper instead of wood. Is this a new material in your practice? EO: I have been making paper models for 30 years. It was for my furniture, as it is now for my sculpture. From drawing to paper model to wood sculpture. . . this has been my process. Paper model-making is an important step for me to see and understand three dimensional aspects before working on a piece in actual size and material. I always enjoy working with paper just like I do with wood. I have an upcoming residency in 2019 at Tamarind Institute in Albuquerque, New Mexico, where there will be an opportunity for me to do some 3D lithography. Because this work will be on paper, I was looking at my paper models and drawings and started experimenting with paper towards the work as a finished art object. Sugar Plum, 2018. 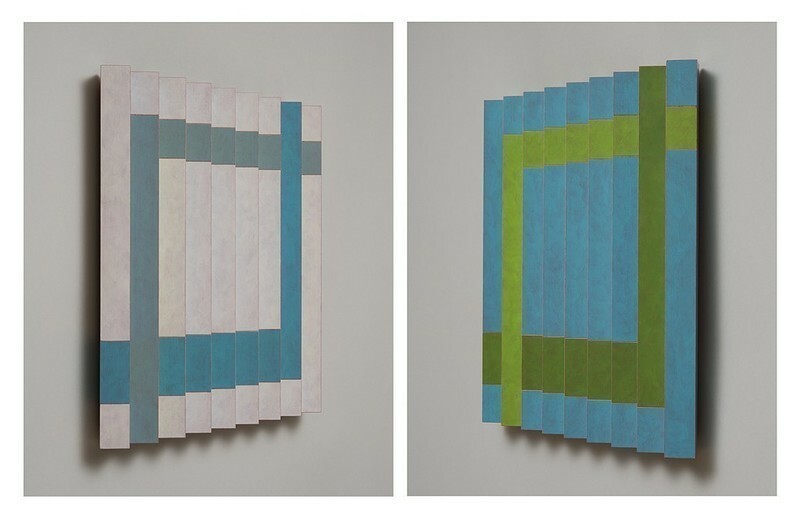 Paper, tape on board. 13" x 13" x 1.5" framed. OPP: Can you talk about the material differences between wood and paper? EO: Paper doesn’t have thickness like wood. Paper is foldable and flexible unlike wood. Paper is more fragile than wood. There are many differences between the two, with what you can and cannot do, yet my paper and wood pieces are alike though in different scales. Some ideas echo in-between wood pieces and paper pieces. 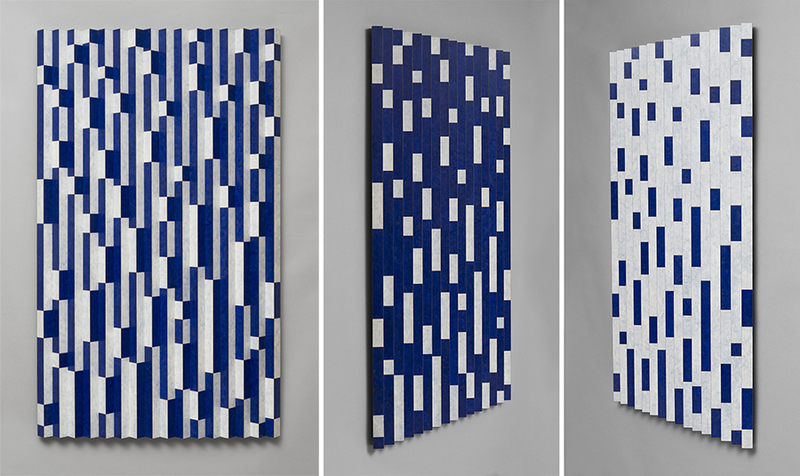 My newest paper pieces are inspired by my wall wood sculpture that changes its look from the different perspectives. I found it is interesting that the reverse process is happening. Adding paper to my materials, my play ground of ideas is expanding. To see more of Emi's work, please visit emiozawa.com.